Which Key Harmonica Should I Use? Beginning harmonica players usually need to be told which harmonica key to use during jams. Asking the key before a song starts is reasonable, asking the key during a song is not. And, if the answer is obvious it is better to know than to ask. Many players will indicate the key, but some will not. Also, asking which key to use for a blues in E is like a soccer player asking a team mate which direction the ball should go. It is better to find out the key without asking, this article shows how. If you are not sure about harmonica keys or second position, then read this article first. To learn more about second position, see my online lessons at Harmonica Academy. In particular, you should know that a set of harmonicas in different keys (as shown above) is needed before joining a jam. A set of harmonicas in keys of A, Bb, C, D, F and G will suit most playing situations. Music is usually played in repeating patterns, each the same length (often 12 “bars”, sometimes 8, 16 or even 32 bars). Each verse of a song starts the pattern, the key of the song is best found at this point. Consider a blues jam. Your solo might start after two verses, longer if a guitar takes the first solo. Use this time to figure out the key of the song, if you don’t aready know it. Blues songs are usually in E, A, G, C or D, with E, A and G the most common. Other keys are used but these are the most common, particularly with guitar players. So, finding the correct key is educated guesswork. First, we review harmonica keys for second position blues. Your harmonica case should be arranged so that these keys are easily located. It helps to take the yellow sticker with the key off the harmonica case and put it on the harmonica, as shown in the picture. While the blues song is going, take a A harmonica and play a 2 hole draw note, very softly so that only you can hear it. Close your right ear with your right index finger, your harmonica will be easier to hear. Now, does it sound right? If so, then you have a blues in E, and you can prepare mentally for your solo. If the harmonica does not sound right, then play the two hole draw on a D harmonica. Better? Then you probably have a blues in A. If not successful, then try with a C, then an F, then a G, then a Bb harmonica. The actual key will almost certainly be one of these. You will soon learn to do this quickly. Now try the same again, this time with a country track. Here the key will be either G, C, D or A. The trial and error method described above for finding harmonica keys will work, a small amount of practice will make you proficient. An even better way to find the key is to watch the guitar chords. Recognising guitar chords is not hard. It is also worthwhile learning some guitar. Even if you play badly (like me! 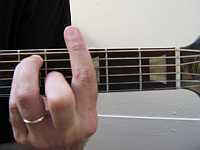 ), a little knowledge of guitar will ease communication with the guitar players you meet in jams. The pictures here show common guitar chords. The first is an E chord. So, if you spot this chord at the start of a song, then it is probably in E.
Often guitar players will use “barre” chords. 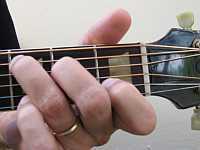 The index finger covers all the frets, the other fingers make the chord. The bottom right picture shows a G barre chord. Notice that it looks like the E chord shown earlier. 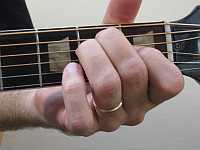 However, because of the “barre” made by the index finger, the E chord shape has move up 3 frets. Each fret is a “semitone”, so the chord becomes a G (G is 3 semitones above E). 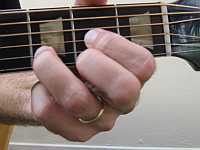 It is useful to recognise barre chords, they are commonly used. 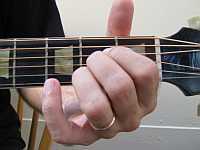 A capo is often used by guitar players, to achieve the same effect as a barre. Essentially the capo changes the key of the guitar. 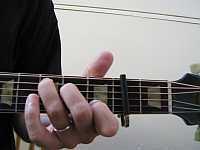 Capo’s are often used by singers, so that the guitar key better matches their voices. 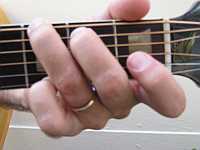 The picture shows a C chord, played with a capo in the second fret. This moves the C chord up two semitones, making it a D.
When a guitar player uses a capo, count which fret the capo is on. This indicates how many semitones the guitar key has risen. Then look at the guitar chord and add the semitones due to the capo (usually between one and three). This takes a little practice, but is a very useful skill. Learning which key harmonica to use will take some practice, but will eventually become second nature. Musicians will be more welcoming if you can determine keys by yourself, as you have taken the trouble to learn their language. You can then just focus on playing well. Check out the Tony Eyers Trio!